After widespread pesticide use devastated the region's bald eagle population, a ban on DDT and the active management of eagle habitat helped the region become home to one of the nation's highest concentrations of these iconic birds. The Chesapeake Bay supports three populations of bald eagles: those that live in the region year-round, those that come here from the Southeast to spend the summer months and those that come here from the Northeast to spend the winter months. The convergence of three geographically distinct populations in the region suggests the Bay plays a particularly important role in bald eagle recovery. 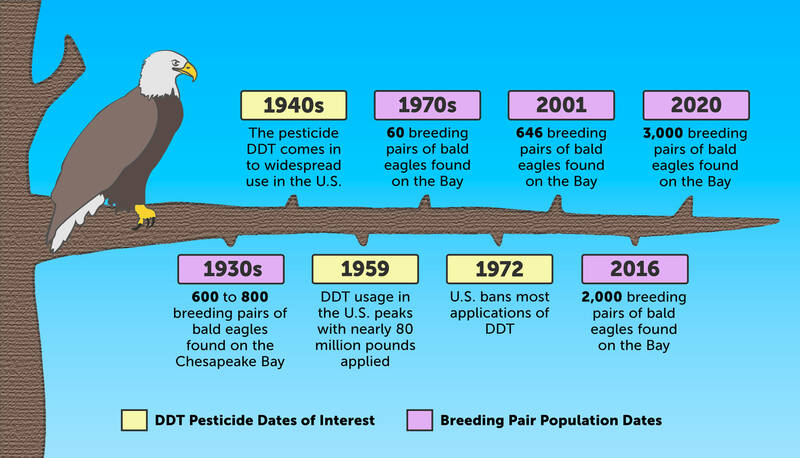 While the widespread use of toxic pesticides almost eliminated bald eagles from the region, a 1972 ban on the pesticide DDT, a 1973 listing under the Endangered Species Act and the establishment of the Bay as an area dedicated to eagle recovery helped populations recover. There are no specific estimates of the size of the Bay's bald eagle population before the early twentieth century, but some believe the Bay once supported one of the densest breeding bald eagle populations outside of Alaska. In the mid-1930s, research indicates the region supported between 600 and 800 breeding pairs. In the mid-1940s, the pesticide DDT was developed and used to control insects in farm fields, homes and gardens. The toxic chemical entered the food chain and caused a deep bald eagle population decline: by the early 1960s, the region supported 150 breeding pairs and reproductive rates reached an all-time low. By the early 1970s, about 60 pairs remained. Fortunately, the elimination of toxic pesticides and the active management of eagle habitat have allowed eagles to recover. Population thresholds for "downlisting" and "delisting" the bald eagle from the Endangered Species Act were met in 1988 and 1992, respectively, and, as of 2007, the Bay's bald eagle population had approached 900 breeding pairs. While Maryland ended its annual population survey in 2004, a 2016 survey of Virginia's bald eagle population by the Center for Conservation Biology counted almost 1,100 breeding pairs. It is likely the two states now have a combined population of more than 2,000 breeding pairs. Today, the fish-eating raptors concentrate in low-salinity waters where fish are most productive. While the availability of undeveloped waterfront, the disturbance of nesting sites during breeding season and the introduction of additional toxic contaminants into the food chain could limit their continued success, several spots in the region support large numbers of bald eagles year after year: the upper James River, the upper Rappahannock River, the upper tidal Potomac River, the Pocomoke River and the upper Chesapeake Bay (including Aberdeen Proving Ground). To protect bald eagles, consider using non-toxic pesticides or chemical-free cleaning products to curb the amount of toxic contaminants entering the water. You can also follow safe and legal disposal methods for paint, motor oil and other household chemicals, and keep pharmaceuticals out of waterways by returning unused medicine to a consumer drug return location.